We recommend that the transportation directors we work with think of their driver training in terms of foundational and advanced topics. Our outline gives ideas and tips to help you compile your own robust driver training curriculum. First, focus on getting your foundational subjects in line, then add advanced courses as needed. Transportation safety training should deliver a comprehensive overview of topics related to school bus safety. This course should be designed to promote a safety-first approach to operating any school bus. Defensive driving skills are essential when operating any type of vehicle. However, school bus drivers face unique challenges. Through a series of school-based driving scenarios, your defensive driving course should teach drivers to respond quickly and effectively to hazards, and to strategically avoid potential dangers. This is a foundational school bus driver training program that should complement your Road Rage, City Driving, and Winter Driving classes. Motorists may become frustrated when they’re trapped behind a bus constantly stopping and going. Likewise, school bus drivers may feel agitated by unruly children or heavy city traffic. These two scenarios can give rise to hostile and impulsive responses that put safety at risk. Your district’s road rage course should offer strategies for dealing with enraged motorists and coping with daily job stressors. Heavy snow and ice puts drivers and students at risk. 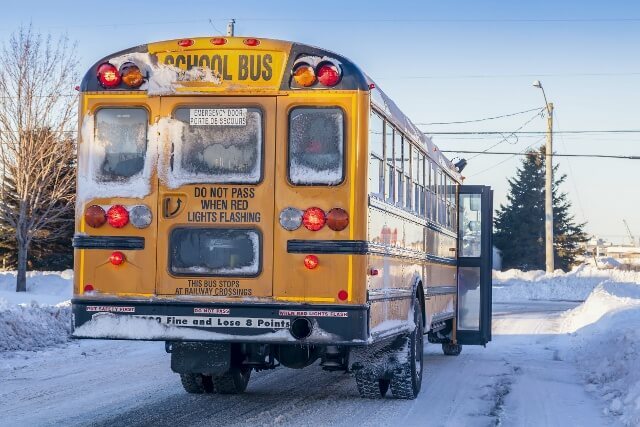 Even school bus drivers who are located in warmer climates with less frequent winter conditions should know how to drive on icy roads. Your winter driving training should address the particular hazards of driving in inclement winter conditions. Driving through a city is very different from driving in a rural or suburban environment. Your city driving training course should prepare drivers to maneuver safely through congested urban streets. This course should aim to present your drivers with realistic city driving scenarios, while explaining how to successfully address the many challenges of maneuvering through city traffic. What are the rules for student behavior on the school bus? What are the consequences of breaking the rules? By knowing the answers to these important questions, your drivers may facilitate proper student conduct on the bus. In your bus behavior course, your drivers should learn the rules for student conduct. It’s helpful for your team to engage in role-playing, so they may learn how to apply the rules in real-life scenarios. Ask your drivers about issues they’ve come across, then work through them during this exercise. School bus drivers and attendants must take special care when transporting young children and students with special needs. Your restraint systems course needs to cover the step-by-step instructions for installing and adjusting different types of restraint systems, and for securing students with seat belts and car seats. Here, your drivers should gain a clear understanding of the CSRS guidelines in your district. Distracted driving is a growing epidemic that continues to worsen. Being distracted while behind the wheel is especially dangerous when children are involved. Your distracted driving course should explain the different types of distractions that happen on a daily basis, and instruct school bus drivers on how to avoid distractions on the bus. Crossing guards are the guiding hands that lead children safely across busy streets. They are also highly visible representatives of your school district. Your crossing guard safety class should instruct crossing guards on important safety standards they need to follow. It should also explain how to resolve any problems that may occur during the course of their job. Additionally, this class should emphasize the importance of guards educating students to adhere to the proper safety procedures of crossing busy streets. During any emergency, evacuating students safely requires fast decisive action by your bus drivers. Evacuating children with special needs presents additional challenges. Your evacuation planning training should be tailored to your school bus drivers and any other staff member who transports students with special needs. This course should identify when to make an evacuation decision, explain evacuation procedures, and help you formulate an effective emergency plan with your staff. Maneuvering a van is a very different experience than driving a smaller passenger vehicle. Sometimes, school personnel may be called upon to operate a van filled with children. Your district’s van safety course should be designed for any school district staff who may be required to operate a van. Your staff should learn about the unique characteristics of vans, along with the techniques for driving them safely. The key to safe driving for your bus drivers is effective ongoing training. The curriculum you put together for your drivers should provide a strong foundation, so your staff learns how to successfully handle their broad range of responsibilities – both on the road and on the bus. The training courses listed above are also available from our affiliate, SafeSchools. SafeSchools courses offer vital training to help your school bus drivers become better prepared to handle all aspects of their job. After completing SafeSchools’ full program, your drivers will feel more confident in their driving, and come out equipped to handle any challenging situation. Get a sneak peek into a SafeSchools bus driver training course and take the “Danger Zones” course, on us!